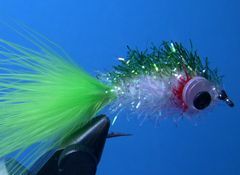 The Spooky Shad is a little slider that was developed by Bill Heugel to fish for schooling bass on Toledo Bend Lake in East Texas. But it certainly can be effective on other fish as well. 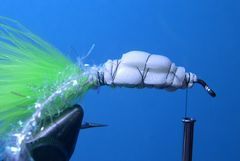 The Spooky Shad is built with an underbody of layered 2mm fun foam that has adhesivie on one side along with 3/4" wide picture/poster tape that has adhesive on both sides. The underbody is then over-wrapped with regular Pearl Estaz to form the body. Fun foam can be found in almost all craft stores. It generally comes in 8 1/2 by 11 inch sheets. Be sure to buy the foam with an adhesive back on one side. Adhesive picture/poster tape is 3/4" wide and comes in rolls. It can be purchased at any store that has picture hanging materials. I purchased mine at Wal-Mart. If you can't locate fun foam with an adhesive back you can use picture/poster tape for the entire process. The best hook for the Spooky Shad is a size 4 Eagle Claw 410 Jig Hook, but the Mustad 34011 stainless saltwater hook in the same size is a great substitute. The Mustad Hook has a straight eye so you will have to bend the eye with pliers to make a turned down eye. 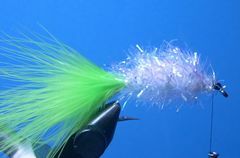 The Spooky Shad in the tying sequence is tied on the Mustad hook. After the Spooky Shad's body is completed, use waterproof marking pens to paint a green stripe down the back and red gills behind the eyes. The Doll Eyes should be attached to the body using Household Goop. After applying a dollop of Goop with a toothpick to the back of each eye, press each eye onto the Estaz body with firm pressure or the eyes will tear off the first time you hook a "toothy" fish. Household Goop can be purchased at any hardware or building materials store. Fish the Spooky Shad on a 6-weight or heavier rod with a floating weight-forward line. I often use a tapered furled leader with an 18-inch length of 4 or 6 pound tippit. Schooling bass arent't skittish so I sometimes use a leader composed of 12 pound Mason hard mono with an 18-inch piece of 4 or 6 pound tippet attached to it. 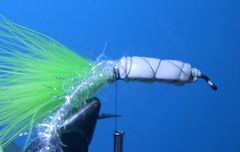 Fish the Spooky Shad with short strips to get the tail moving and try to "walk the dog" with it. Even when the Spooky Shad is sitting still the tail undulates, drawing many strikes. 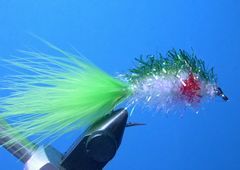 I have only used the Spooky Shad on schooling bass on Toledo Bend Lake but I plan to use it this summer in saltwater for Specs. I also plan to use the Spooky Shad tied with rootbeer Estaz for Redfish. 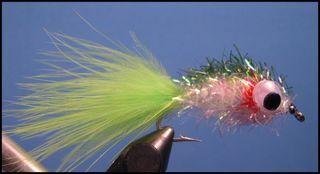 It should also be a pretty effective Striper fly. Clamp the hook in the vice. Then start the thread behind the hook's eye and lay down a substantial base of thread back to the hook's bend. 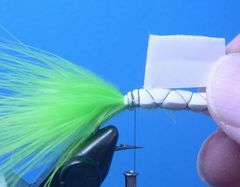 Tie in the Marabou tail at the rear of the hook. The tail should be about one and one-half the length of the hook. Cut a piece of fun foam that is about 3/8" wide. The length of the foam should cover the hook's shank from the base of the tail to slightly behind the hook's eye. Bind the foam tightly at the front and the rear with softer wraps of thread over the body. Don't put much pressure on the thread as you are wrapping it over the body. You don't want to compress the foam because it will hamper the floatation of the fly. Cut a second piece of foam from the picture/poster tape that is slightly more than two-thirds as long as the first layer of foam. Bind that piece of foam to the body with wraps of thread as shown. Don't put too much pressure on the thread. All you want to do is hold the foam in place. Tie in an eight-inch long piece of Estaz at the base of the Marabou tail as shown. Now cut the third piece of foam from the picture/poster tape that is about two-thirds as long as the second piece. You are using picture/poster tape for the second and third layers because it has adhesive on both sides and the adhesive helps the Estaz body stick to the underbody. Bind this last piece of foam as shown with thread wraps. The thread should end up on the shank at the place where you will tie off the Estaz in the next step. Wrap the Estaz forward to form the body. Tie it off and trim any excess. 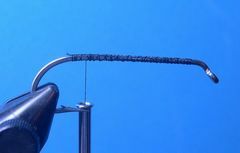 Form a neat thread head and tie off the thread with a couple of half-hitches or a whip finish. Coat the head with head cement. Paint a green stripe on the Spooky Shad's back and a spot of red on each side for the gills. 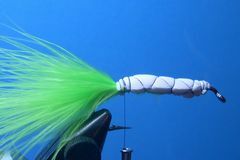 Glue on the Doll Eyes with Household Goop and your Spooky Shad is ready to fish.